The Vital Breath bio states that fans of Alter Bridge, Disturbed, Alice In Chains and Dream Theater should enjoy 'Angels Of Light'. I think to use the word "enjoy" is misleading and "tolerate" would be a more fitting transitive verb. This is the French quartet's sophomore full-length release and follows 'Duality' of which I have no knowledge. The current line-up includes Jérôme Ponsolle (lead vocals/guitar), Francois Brisk (drums), Wayne Loeuillet (guitar) and Christophe Blanc-Tailleur (bass), and they all appear to be seasoned musicians having experience with a number of other bands. 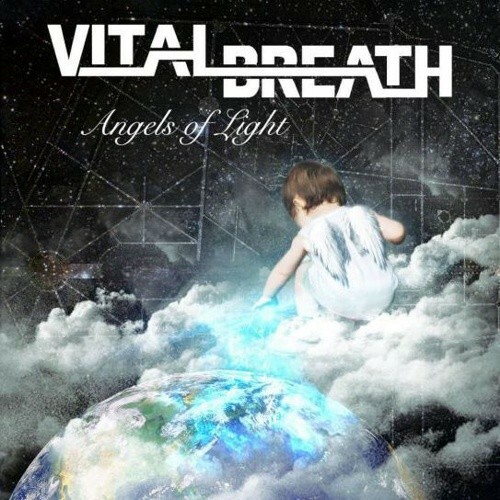 Vital Breath can be considered Modern/Alternative Rock, though they would have you believe some of the sloppy song structures could be labelled Progressive. Musically there are a few interesting ideas but they sit together uncomfortably, are cluttered and lacking focus becoming lost within a barrage of amateurish arrangements. Ponsolle's vocals are also a major let-down. His delivery is very slightly accented and that would not be a problem if it had greater identity or definition. He is also the primary song-writer and is in need of assistance. The instrumental passages during the likes of 'Brother', 'What About Love' and closing track 'Would You Rather Sleep' show some quality but the singing tends to detract from their appeal. One or two guitar solos display good technique and are inventive enough but others are just clumsy. Vital Breath have a decent energy and more often than not the songs begin promisingly before losing their way as they try to cram as many ideas as possible into a four minute running time. The use of piano and strings adds another dimension to the sound but it also creates the opportunity to add even more clutter. 'Missing God', near the end of the album, is virtually unlistenable thanks to an overly quirky riff and some strange instrumentation and misguided vocals. After several plays, I'm left frustrated. There are obviously some talented individuals in the band and the production values for a minor league release are not bad. I'm also left feeling disappointed. Everything comes together poorly and more thought needs to be put into song construction if Vital Breath are to develop and progress.